Stuart Sillars: The Illustrated Shakespeare 1709-1875. Cambridge: Cambridge University Press, 2008. Pp. xxii + 394. Cloth £ 60.00. Shakespeare illustrated has been a subject of considerable interest for critics, artists and readers of the plays for some time; yet up to now, W. Moelwyn Merchants influential Shakespeare and the Artist, published over half a century ago, still remains the only study that gives anything like a full account. From this rich field Stuart Sillars magnificent volume has wisely selected the so far largely unchartered area of illustrated editions, from Rowe onwards, up to the virtual fading out of the species towards the end of the nineteenth-century. 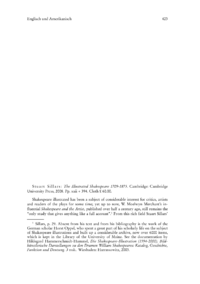 His admirable introduction shows exemplary critical discrimination and bibliographical competence as well as rare literary and artistic sensitivity, beginning with a discussion of vital distinctions between text, image and performance in Shakespeare criticism as well as the variant vocabularies used for the issues involved (e.g. the text as musical score, misleading, but fashionable for a time in the 1960s).